This post is a reminder that the 2009/2010 individual savings account (ISA) 05 April 2010 year end is fast approaching. If you haven’t already taken full advantage of your annual ISA allowance then you may want to investigate now before it’s too late. Once the year ends the opportunity is lost forever. As a mid 30’s investor I have taken full use of my allowance of £7,200 already this year by investing within a stocks and shares ISA. If you are opening an ISA be careful to look for the lowest fee ISA (particularly for stocks & shares ISA’s) that suits your needs as fees are another area to watch if you want to maximise your investment returns. The stocks and shares ISA provider I use, TD Waterhouse, does not charge me an annual fee provided I have over £3,600 invested. 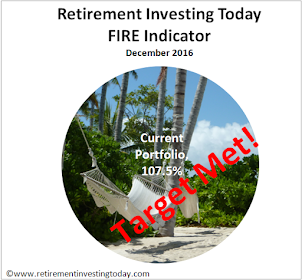 In addition to minimising fees my retirement investing strategy aims to invest as tax effectively (by investing in tax wrappers and tax efficient investments) wherever possible. Without fail I therefore allocate my maximum allowance annually in ISA’s and currently have 9.4% of my low charge portfolio allocated within the ISA wrapper. I’m sure most readers are familiar with ISA’s however for those that aren’t let me give just a few words here. ISA’s are tax wrappers that enable you to be sheltered from income and capital gains tax. 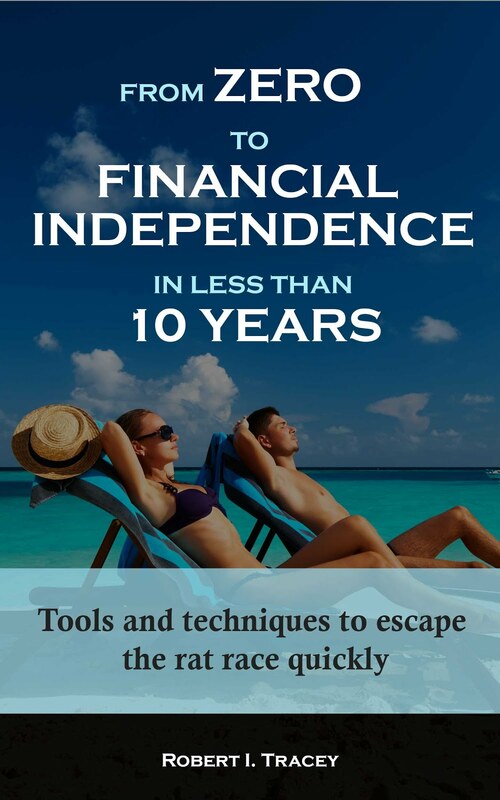 There are two types of ISA – cash ISA’s and stocks & shares ISA’s. If you are under 50 you can save £3,600 in cash ISA’s and if 50 or over you can save £5,100. Whatever you have not saved in cash ISA’s can be saved in stocks & shares ISA’s up to a maximum £7,200 if under 50 and £10,200 if 50 or over. From the 06 April 2010 when the new ISA year starts everyone can save £5,100/£10,200 respectively. They can be complex however I’ve found most information that I need online without too much difficulty and am satisfied that I personally know enough about them to use them. I was actually surprised to read a statistic, courtesy of MoneyWeek, that said that 80% of ISA accounts last year were cash ISA’s. This makes me think that the majority of people are not taking full advantage of the full £7,200 available but also that most people will probably be getting returns that are less than inflation on their money. Personally, I don’t have any cash ISA’s with all assets in stocks and shares. As a higher rate taxpayer stocks & shares ISA’s shelter me from tax on dividends plus also capital gains. A basic rate tax payer buying a stocks and shares ISA is mainly sheltered from capital gains tax however if I was a basic rate tax payer I would still buy my assets within an ISA. This is because if your annual allowance is not used each year it is lost and you just never know when you might become a higher rate tax payer particularly given the current state of the country and the likelihood of tax rises going forward. My spreadsheet today gives a brief example of why I am so keen to minimise the taxes I pay and thus why I take ISA’s so seriously. 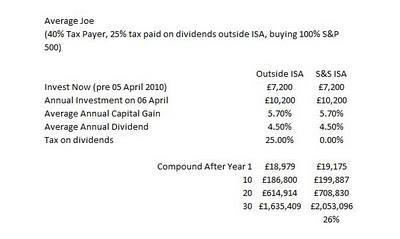 Average Joe (that’s me) is a 40% tax payer and invests £7,200 in a stocks and shares ISA now plus then every year invests £10,200 on the 06 April. Additionally, he also invests £7,200 outside any tax wrapper now plus £10,200 on the 06 April annually. He decides to buy the S&P 500 with both his ISA and non-ISA investments which since 1881 has seen a capital gain arithmetic mean of 5.7% (ignoring the erosion of asset value that inflation causes) and has seen a dividend arithmetic mean of 4.7%. He keeps this investment policy in place for 30 years and then comes back and looks at the value. Minimising fees and taxes matters when compound interest is concerned and this simple example shows that after 30 years Average Joe has 26% more assets within his ISA investment rather than outside. This is why I take ISA’s so seriously. I was amazed at the difference and had to check my numbers twice. Don’t give the government any more than you have to. Additionally, when he comes to sell any of the assets within the ISA has no capital gains tax to pay however outside the tax wrapper he may have a problem depending on how much he wants to sell and how that compares to the capital gains tax free limits (if they still exist in 30 years) available to him.